Observation - Colourful Nymph - Global. 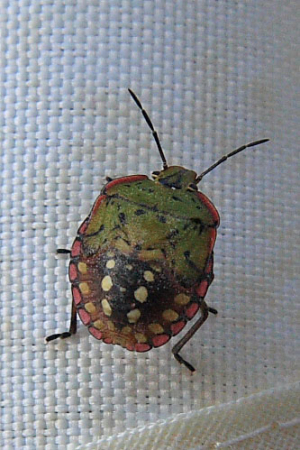 Description: Clinging to a tablecloth on a market stall in Riez, southern France, I spotted this colourful creature which my rudimentary field guide would have me believe is a nymph of Nezara Viridula. Clinging to a tablecloth on a market stall in Riez, southern France, I spotted this colourful creature which my rudimentary field guide would have me believe is a nymph of Nezara Viridula.